Being forced to use someone else' WYSIWYG is all it takes to remind you of how you good you have it when you're able to edit the HTML. Also, Enes Kanter is maybe the most consistent performer on a night to night basis in the NBA. WYSIWYG almost every single night. WYSIWYG stands for "What You See Is What You Get (pronounced Wizzy-wig. See Entry For Derived Acronyms)"
How to abbreviate "What You See Is What You Get (pronounced Wizzy-wig. See Entry For Derived Acronyms)"? What is the meaning of WYSIWYG abbreviation? The meaning of WYSIWYG abbreviation is "What You See Is What You Get (pronounced Wizzy-wig. 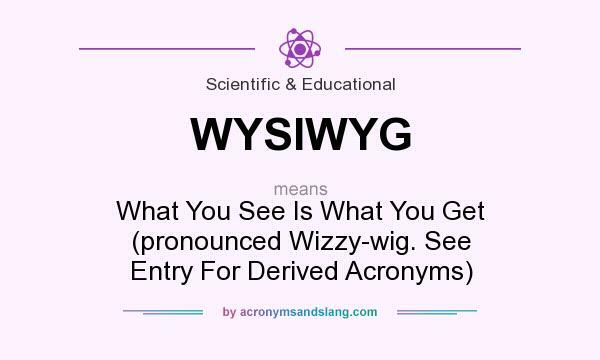 See Entry For Derived Acronyms)"
WYSIWYG as abbreviation means "What You See Is What You Get (pronounced Wizzy-wig. See Entry For Derived Acronyms)"